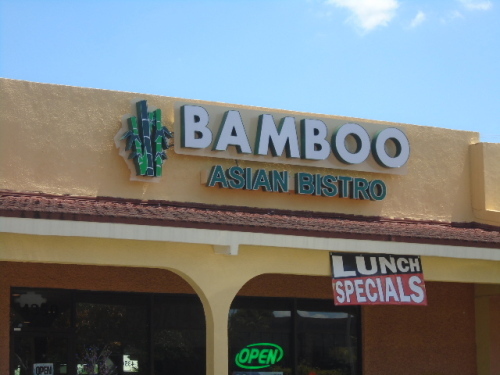 We had a groupon for Bamboo and decided to try it for lunch one day arriving at around 1 PM only to see the waiter? Owner? Manager? Chef? step outside to answer his cell phone. Another party of two arrived just before us and the 4 of us were at sea for a bit until I took a menu and we sat down at a table with the other couple doing the same. Eventually Shawn--at least that is the name on the bill--took our drink order and finally our food order. Aside from a woman coming out from the back with what looked like a delivery order we didn't see anyone else working in the restaurant. Allen ordered the sweet and sour chicken special ($7.50) served with a salad and veggie rice and a can of coke ($2). I had the Cashew Nut Chicken ($7.95) with miso soup and veggie rice plus a coke. We shared a large bowl of Red Bean ice cream. There was nothing wrong with the food or the service but it all seems robotic and nothing really saying 'You have to come back'. Aside from the specials the regular priced items were a little bit higher than found on other menus. With the groupon--$15 for $30 worth of food- the lunch cost us about $10 including tax and tip. I did question allowing us to use the groupons on the specials but Shawn said that was okay. I really see no reason for going to the Bamboo Asian Bristro, with or without a groupon, unless you like bamboo which all the different shades and kinds intrigued Allen!